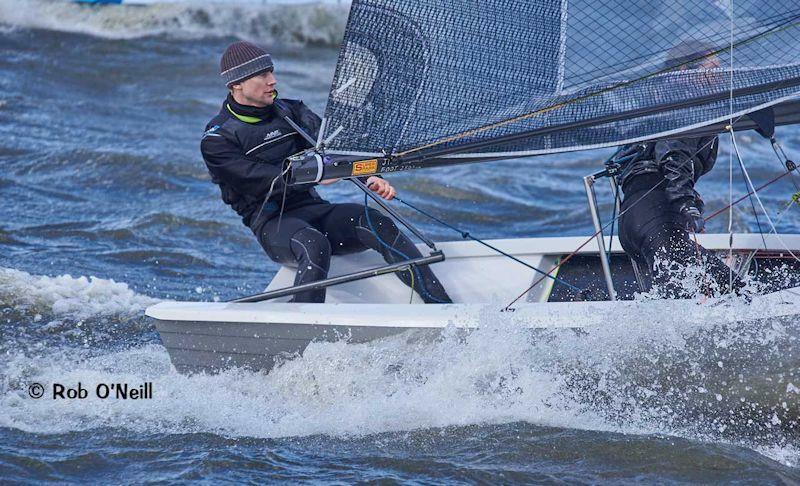 Sunday, 17th of March saw the second Craftinsure Merlin Rocket Silver Tiller meeting of the season hosted by Wembley Sailing Club. By way of a change from the seemingly constant storms and heavy rain, the day started with blue skies and a moderate westerly breeze of around 15 to 20 mph although this was to change! A total fleet of 28 boats entered with visitors from Bartley, Blithfield Fishers Green, Hampton, Itchenor, Lymington and Parkstone. All were treated on arrival to complimentary coffee and tea with bacon rolls. 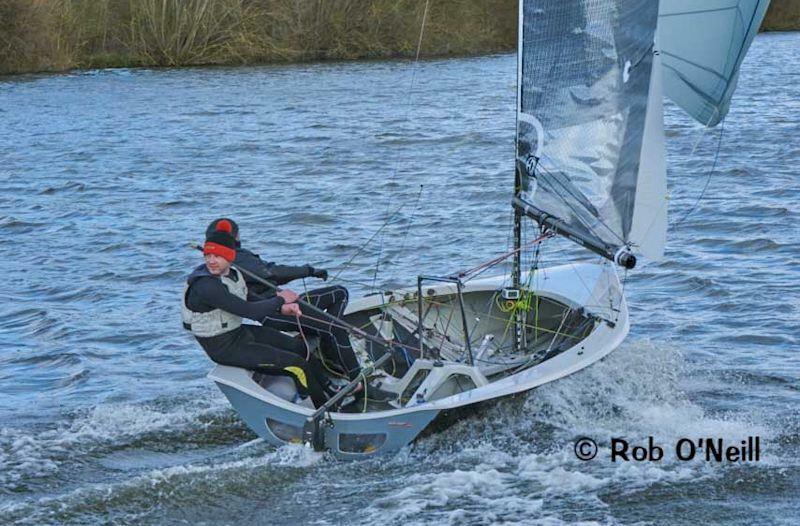 The first race got off to a clean start with Chris and Livvy Bell leading around the windward mark, followed by Andy Davis and Alex Warren and then a group of boats led by Matt Biggs and Becka Jones. Andy and Alex took the lead down the first long run down the Welsh Harp and went on to finish three minutes ahead of the chasing pack, led by Chris and Livvy. As usual the Wembley format of three races back to back meant that Jon Gill the race officer, allowed the on water distribution of water and Mars Bars, before promptly starting the second race. Again there was a clean start and Andy and Alex started towards the pin and were able to tack onto port to clear the fleet and lead round the windward mark. Matt and Beka pushed them hard but Andy and Alex took the gun. Other new faces at the front included Andy Dalby and Chris Horn who showed early promise before fading. 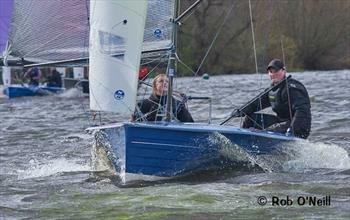 The third race was postponed to allow the fleet to ride out a particularly nasty squall complete with hailstones. The squall over, the third race started in sunshine and a relatively gentle breeze, only to result in the first recall of the day. 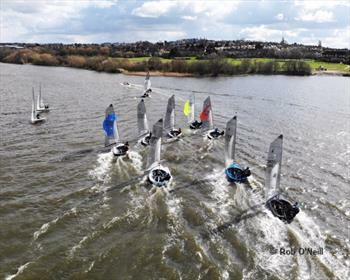 The fleet was away at the second start but the wind was building with big shifts. Matt and Beka hooked onto a major port tack lift that had them around the windward mark first. Unfortunately this led them to become so over excited they capsized during the short run across the Harp to the gybe mark. This allowed Andy and Alex and Steve and Gill Leney through to first and second. Meanwhile the weather was deteriorating with a darkening sky of biblical appearance and proportions the resulting squall flattened many in the fleet leaving a large number capsized and those that remained upright a memorable white knuckle ride downwind. At the finish Andy and Alex were first, Chris and Livvy second and Steve and Gil third. The remaining tired but exhilarated competitors came ashore for the customary Wembley chilli con carne, which well went down very well after the enjoyable but strenuous three races back to back. Thanks to Jon and Judy Gill and RS200 and Laser fleets for running the day and we all look forward to the next round at Chichester and Itchenor. 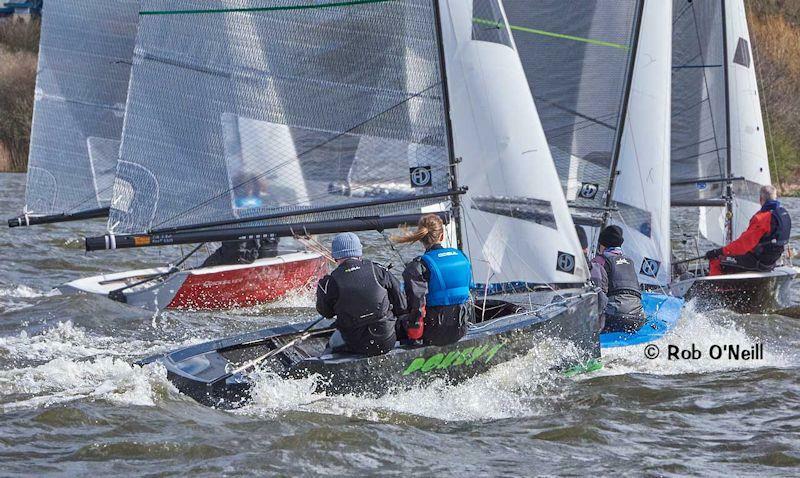 The Silver Tiller 2019 is sponsored by Craftinsure, with Magic Marine as the class clothing partner.